March 31, 2016. The Fiscal Policy Institute is pleased to hear that a deal has been reached on increasing the minimum wage and that New York is on a path to $15 for all workers. This historic decision will provide wage increases to over 3.1 million New Yorkers that need and deserve a raise. Approximately 46 percent of workers benefiting from this increase, those in New York City, will see their wages rise to $15 per hour by the end of 2018 (2019 for workers in businesses with 10 or fewer employees). Another 15 percent of affected workers in Long Island and Westchester will reach $15 an hour by the end of 2021. The remaining 39 percent of workers, those in upstate New York, will be reach $12.50 by 2020, rising to $15 based on an indexing formula determined by the New York State Division of Budget in consultation with the Department of Labor. 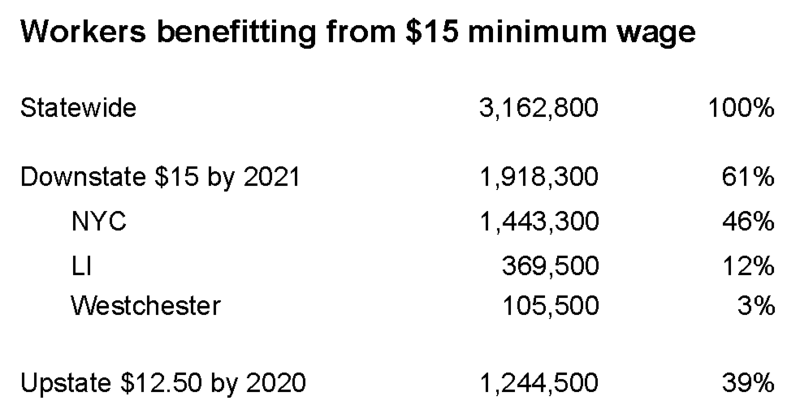 The research is clear that a statewide $15 minimum wage makes economic and fiscal sense for New York and will lift the living standards for over 3.1 million New Yorkers. Reversing years of wage stagnation, this will help grow our economy from the bottom-up. Businesses, large and small, will be more productive and see their sales increase. Our research showed that when wages are compared at an occupational level, workers both upstate and down receive fairly similar hourly pay. The Fiscal Policy Institute is committed to making sure that every New Yorker receives a living wage, regardless of where they live or what they do in New York State. We are also committed to developing a fair tax structure in New York that provides needed revenue to meet our many glaring human and physical infrastructure needs. Raising the minimum wage is the first step toward that goal, creating a fair tax structure is the next step that we must take. As the minimum wage is phased in across the state, we expect that Medicaid reimbursements and funding for state human service contracts will rise commensurately to ensure that this critical sector of the workforce, that provide some of the most essential public services to many vulnerable populations across the state, can also get the wage increase they need and deserve.